The composite industry looks toward a new material system (resins) based on thermoplastic polymers for the vacuum infusion process, similar to the infusion process using thermosetting polymers. A large number of thermoplastics are available in the market with a variety of properties suitable for different engineering applications, and few of those are available in a not yet polymerised form suitable for resin infusion. The proper selection of a new resin system among these thermoplastic polymers is a concern for manufactures in the current scenario and a special mathematical tool would be beneficial. In this paper, the authors introduce a new decision making tool for resin selection based on significant attributes. This article provides a broad overview of suitable thermoplastic material systems for vacuum infusion process available in today’s market. An illustrative example—resin selection for vacuum infused of a wind turbine blade—is shown to demonstrate the intricacies involved in the proposed methodology for resin selection. Ever growing demand of composites for high productivity includes the use of thermoplastics resins for variety of engineering applications making it a vital business in the market. Industries are constantly developing new applications using thermoplastics technology to find solutions for high performance products by interacting with their customers, and business partners. 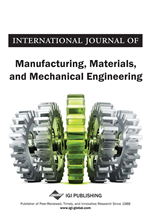 Designing such a new material which can be processed similar to the processing of thermosetting polymers is a challenging and a critical task in the design and development of composite products for diverse engineering applications. Constituent materials play a crucial and important role during the entire design and manufacturing process of composites. Hence wrong selection of material often leads to huge cost involvement and ultimately drives towards premature component or product failure. So the designers need to identify and select proper materials, by defining proper functionalities satisfying attributes requirement and expecting the desired output with minimum cost involvement and specific applicability. In spite of many advantages associated with processing of thermosetting composite, there is a recent industrial trend to choose high-performance thermoplastic resins due to its potential for recyclability, superior toughness, weldability, thermal processability and environmental friendly, but they require often high pressure and high temperature processing. This will end up with expensive processing techniques, especially for geometrically complex and larger products. Therefore, there is a wish to be able to use the versatile Vacuum Assisted Resin Infusion Method (VARIM), which is the preferred manufacturing process for complex and larger shaped geometrical products used in today’s industrial environments for thermosetting composites. There is very few reports cited in the open literature about development and use of new kinds of thermoplastic polymers for the VARIM process (Brønsted et al., 2005; Van Rijswijk et al., 2006; Khattab & EI-Gizawy, 2008). In general, liquid molding of thermoplastics has limitations because of high resin viscosity, high temperature processing requirements, and a narrow processing window (Ramesh & Jan-Anders,(2000; Rudd et al., 1997). The main obstacle to the economic manufacturing of a large thermoplastic composite like wind turbine blade is that the flow viscosity of most thermoplastic polymers is very high, in comparison to the viscosity of uncured thermosetting resins. Thermoplastic polymers with desirable mechanical properties such as polybutylene terephthalate (PBT), polyethylene terephthalate (PET), polyamide-6 (PA6), polyamide-12 (PA12), polyamide-6,6 (PA6,6) and also polyether ether ketone (PEEK), polyetherketoneketone (PEKK) and polyphenylene sulphide (PPS), have flow viscosities several orders of magnitude higher than uncured epoxy, polyester or vinyl ester resins. Few articles report how thermoplastic materials like casting grade PA6 - caprolactam with a sodium-based catalyst, and an initiator are used to study the intricacies involved in processing composites using VARIM (Van Rijswijk et al., 2005a, 2005b). This system allows the resin to maintain a very low viscosity (<1 Pa·s) for a reasonable period of time, at relatively low temperatures (1000C). Another resin called cyclic butylenes terephthalate (CBT®) resin, which is a solid material that melts to ultra-low viscosity and polymerizes into poly butylenes terephthalate (PBT). This resin is processed like a thermosetting and ends up like a thermoplastic (Mallon et al., 2003; Hakme et al., 2007) (http://www.eirecomposites.dom/wind_energy_composites.asp).